During the Honorable Minister Louis Farrakhan’s 1997 World Friendship Tour that included Liberia, he proclaimed even though Africa needs substantial assistance, it has the ability to help itself. Up until last year, Africa was well on its way toward heeding Farrakhan’s prophetic words. Libyan Pan African leader Muammar Gadhafi was the principal force behind evolving the stagnant Organization of African Unity into a more productive African Union. He invested an estimated $150 billion in Africa and with a Libyan proposal on the table for an African Union Development Bank (AUDB), backed by $48 billion, the continent seemed on the road to economic independence. Not only was the AUDB designed to overcome Africa’s economic dependence on Europe and America, Gadhafi’s Libya was the biggest obstacle to Africom (the U.S African Military Command) spreading its military tentacles throughout the continent. Gadhafi, according to news reports, offered cash incentives, to countries that rejected U.S. request for bases. During a 2012 press conference in Port of Spain, Trinidad, Farrakhan expressed his chagrin concerning how the Obama administration used the Libyan invasion as a pretext for expanded insertion of Africom on the continent. Not only was the overthrow and murder of Gadhafi used by the Obama administration to pave the way for the establishment of continent-wide military operations, it was also the pretext for revamping of the centerpiece of U.S. trade policy for Africa, through former President Bill Clinton’s African Growth & Opportunity Act (AGOA). In a letter written by Barack Obama entitled, “Enterprise for Development: A New Policy Approach Towards Africa,” and read by Clinton’s fellow traveler, U.S. Trade Representative Ambassador Kirk in Zambia, America’s 44th president wrote his administrations objective was to extend and expand President Bill Clinton’s 2000 AGOA initiative to 2025. 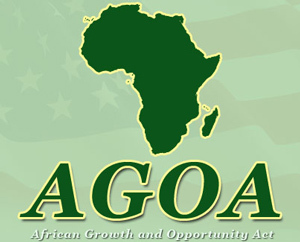 What AGOA claims are reduced trade barriers of American markets would be a boon for African exporters. But if you look at the actual trade policy you’ll find more symbol than substance, more “sugary rhetoric of American benevolence” for the welfare of Africa than is actually provided, according to Jason Hickel in a 2011 edition of Pambazuka News. The catch Hickel writes is the U.S. president “reserves the right to reevaluate” eligibility in AGOA on an annual basis. What this means is AGOA eligibility requires the “outright destruction” of all tariff protections, by “flinging open African markets to a flood of American goods that inevitably undermine local industry,” said the publication. The real objective of AGOA, that’s not mentioned, is to “pry open” and exploit new markets for American goods and to nullify barriers that could obstruct U.S companies like Exxon, Shell, and Anglo-American, from extracting Africa’s rich oil and mineral reserves. Posted on 9th May 2014 by newsafrica. This entry was posted in Headlines and tagged Addis Ababa, Africa, African Growth & Opportunity Act, African Union, Africom, Barack Obama, Bill Clinton, United States. Bookmark the permalink.